Using the same underlying hardware as Microsoft's Kinect, the Matterport scanner (right) creates sophisticated 3D scans (left) for a fraction of the usual cost. Matt Bell isn't a big videogame player, but when Microsoft's motion-sensing gaming system Kinect came out in late 2010, a light bulb went off. Bell envisioned using the Kinect's underlying technology for other things, like reconstructing the world in 3D. "I wanted to be able to scan a room, digitally send that to someone else and let them walk around in it on a computer screen," he says. 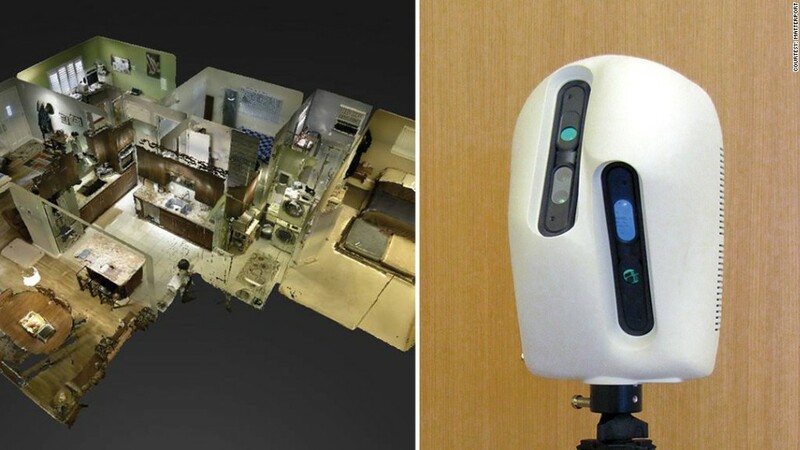 Creating a 3D scan of a physical environment is typically done with a laser scanner -- a process that's labor-intensive and slow, according to Sam Pfeifle, executive editor at the SPAR Point Group, a trade publisher for 3D imaging professionals. It's also expensive. "A high-end laser scanner costs about $40,000," Pfeifle says. "The Kinect is basically a $150 version of that." Bell dove in and started Matterport in Mountain View, Calif. with longtime friend and programmer David Gausebeck. Eight months later, they added Mike Beebe, who worked on 3D reconstruction for the military at Stanford Research Institute. The partners created a handheld scanner that looked like a cross between a camera and a Kinect sensor. It worked well for scanning objects, but wasn't very efficient for interior spaces. Cue the redesign. The latest model has a head that fully encloses two cameras sitting atop a tripod. An iPad functions as the remote. The device's innards use the same PrimeSense hardware, repacked by Asus in its Xtion motion-sensing system, that Microsoft uses for the Kinect. Hit "scan" and the head starts turning 360 degrees, while the Matterport's iPad screen shows the model being built up in 3D. After it's finished, an email goes out with a link to the scan on a private site for clients. The owner can view it, share it, take measurements or make notes on it. "We want people to be able to communicate in 3D," says Florence Shaffer, Matterport's vice president of sales and marketing. One of the company's first scans was of elite tech incubator Y Combinator's 3,500-square foot office space in Silicon Valley. (Matterport was selected for Y Combinator's first 2012 mentoring class, which ran from January to March.) It takes about 45 minutes to scan a space that size. To understand how the scanner works, think of each captured image as a jigsaw puzzle piece. The scanner's cameras produce individual 3D snapshots, which the software fits together. Aligning all those images is a complex process. It took Matterport's founders about six months to develop a prototype that worked. Then they spent a year talking to customers to refine their device and make it easier to use. The company is currently running off a $1.6 million round of seed funding and a small cash injection from Y Combinator. It has just begun delivering scanners to paying clients, although it still considers its technology to be in "beta" through the end of this year. Pricing details are still being worked out, but Bell says that the cost of a Matterport scanner will be "a small fraction" of the cost of a laser scanner. SPAR Point's Pfeifle says Matterport created something no one else has yet: an industrial device based on Kinect-like technology. "This is the first time I've seen anyone come out with a product meant for commercial use and not video games," he says. He thinks the company's biggest challenge will be simply spreading the word that it exists. "There may be problems that the scanner could solve that Matterport's people haven't even envisioned yet," he says. Matterport's early customers are mostly large companies in the construction, real estate and retail industries. "You could scan the construction site every day, which would allow you to intervene before there are any big problems," Bell says. For retailers with stores spread out geographically, 3D scans can provide a detailed window into the physical layout of merchandise at the store level. Real estate agents could use Matterport's scans to allow their clients to virtually visit a house. "Panoramic photos don't let you walk around in a space the way a 3D model can," says Bell. They also don't let you see if your couch fits in the living room, as Matterport's scan does. That's one reason why Manhattan startup Lofty is using it. "Matterport's technology blew me away," says CEO Dave Eisenberg, who hunted through many of the commercially available 3D capture options. Lofty takes 3D models of home and office spaces and makes them usable on the web for consumers. CEO Dave Eisenberg says his team is building software to layer on top of Matterport's scanning technology: "We will beautify the 3D models, making them more user-friendly for those who aren't familiar with 3D."